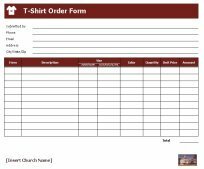 The TShirt Order form is available below free to download, customize and print for your next church event or church fundraising event! Does your church ever want t-shirts for church events such as Youth Camp, Sunday School, fundraisers or any type of event where you want to go as a church group with a specific message on the shirt and all one color so you can keep up with the group? If yes, then you might need download and print the free form for ordering these type of t-shirts below. Church Name and/or Logo/Picture - Insert your church name and/or your church logo or just a picture in the footer of the form. Suggested Title or Title of Form - Insert the title of your choice or just leave the title as it is. Submitted By - Insert the full name of the person submitting the t-shirt order form to the t-shirt design business. Phone Number - Insert the best contact phone number of the person submitting the t-shirt order form. Email Address - Insert the email address of the person submitting the t-shirt order form. Mailing Address with City/State/Zip - Insert the mailing address of the person submitting the t-shirt order form or the mailing address of the church office where the person submitting the form is working. Item Number - Insert the item number of the t-shirt if this applies. Description - Insert the description of the t-shirt if this applies. Size - Insert the size of the t-shirt you need (Adult Youth, XS-Extra Small, S-Small, M-Medium, L-Large, XL-Extra Large, XXL-Extra, Extra Large). Color - Insert the exact color of t-shirt you need. Quantity - Insert how many of that particular t-shirt that you need. Unit Price - Insert the price of that particular t-shirt. Amount - Insert the total amount of money that you will owe for the t-shirts. Example: If you ordered 2 t-shirts for $15 then you would insert $30 in the amount. The church events that require t-shirts for the workers and/or volunteers will be much easier to organize with this t-shirt form and in turn will save your precious time and help organize your church event, etc. Always modify the form to fit what your church needs to set up their own requirements. Return to Prayer Request and More Request Forms from TShirt Order Form.